As The Globe and Mail’s Grant Robertson reports, Moody’s Investors Service downgraded the ratings of several of Canada’s banks yesterday, citing the potential for trouble. Among those downgraded were Toronto-Dominion Bank, which lost its triple-A ranking, Bank of Nova Scotia, Bank of Montreal, Canadian Imperial Bank of Commerce, National Bank of Canada and Caisse Centrale Desjardins. Wait, what? Canadian banks are being downgraded? I thought Canada had the best banking system in the world. Or maybe ratings agencies are finally doing their job and rating banks based on present risks. Both Moody’s and Fitch Ratings, which reaffirmed the levels of the major banks, stressed that the country’s banks are sound, but they’re concerned over some issues, and how they could affect the financial services industry. 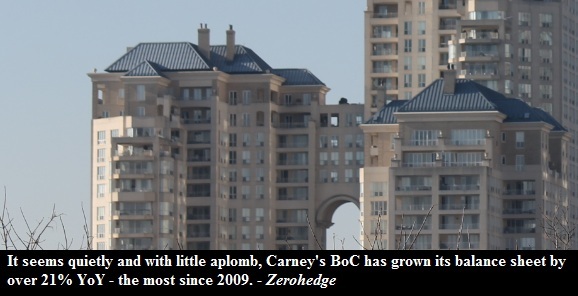 “The main domestic threat to the stability of the Canadian banks is the record level of consumer indebtedness and the risk of overvaluation in the housing market,” said Fitch. “Between 2001 and 2012, Canadian home prices appreciated by approximately 116 per cent and the household debt-to-disposable income ratio increased to 166.7 from 108.3,” it added in its statement. As I discussed in my previous post, rising housing prices and household debt go hand in hand. If the debt levels of Canadians stayed right where they were in 2001, the housing prices would have never doubled. For more on Canadian debt, please read Canadian Housing Bubble Fueled by Debt.